﻿ Step 3: The Client Detail Page. Step 3: The Client Detail Page. 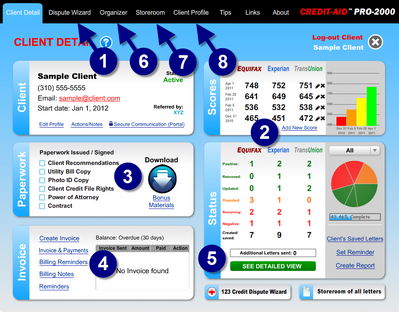 The client detail page is a dashboard of your client’s overall health. This page gives access to all advanced features, but most often you will go right to the Dispute Wizard. 1)Dispute Wizard is your starting point for every client. 10) View letters you’ve saved for this client, create reminders and reports. 11) Log out to work with another client.